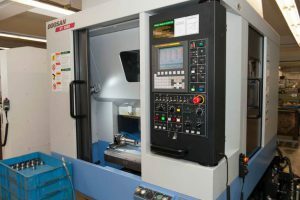 In our CNC processing centre we manufacture complex single parts as well as standard parts with high precision, out of all forms of normal and stainless steel, aluminium and other machinable non-ferrous metals. Several machines are partly joined together by a palette pool or a mounting robot. We produce the mounting devices needed for production ourselves, here in our fixture construction, so that they precisely match the manufacturing conditions.